The Mystery Inc. gang heads to the snowy peaks of the Himalayan mountains to track down a lost chest that contains the spirits of 12 captured ghosts on Scooby-Doo! and the Curse of the 13th Ghost, an all-new, full-length animated film available on Digital and DVD February 5, 2019 from Warner Bros. Home Entertainment. It’s an action-packed adventure the whole family can enjoy together as the lovable Great Dane and the teen sleuths embark on a thrilling voyage to find the lost chest and capture the 13th ghost – the one that got away! 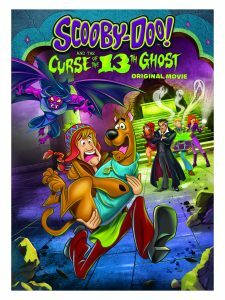 Based on the classic animated television series The 13 Ghosts of Scooby-Doo, in this brand new film, viewers will finally learn the identity of the 13th ghost – a mystery that has never been revealed before. Scooby-Doo! and the Curse of the 13th Ghost will retail for $19.98 SRP. After the Mystery Inc. gang goofed up a case and nabbed an innocent man, they’re forced into early retirement from crime solving. It’s not long however, before their old friend Vincent Van Ghoul needs help and pulls the team right back into action. The gang has unfinished business they must tend to, which involves catching a ghost that previously got away. It all happened one summer while Velma and Freddy where away at camp. Scooby-Doo, Shaggy and Daphne secretly hunted down 12 of the world’s spookiest ghosts but failed to catch the most evil one of them all…the 13th ghost. Now the elusive spook is wreaking havoc. Vincent needs help having him captured and confined to the chest of demons, a box that contains the other 12 captured ghosts. With the 13th ghost still on the loose, the gang will have to come out of retirement and finish the job once and for all. The chest however, is now located somewhere in a remote village in the Himalayas. Determined to help Vincent, the gang sets out on one of their most thrilling adventures yet! Bundle up and get ready for the icy slopes of the Himalayan mountains, chilling car chases, crystal balls and spine-tingling spells in this terrifyingly fun original movie! I had the chance to check out this fun DVD and I highly recommend for children and adults! It would be great for a family movie night! I grew up watching Scooby -Doo and the gang and also it has been a hit with my son when he was younger. This one has it all! It’s fun and packed with adventure and has an unique story line! Look for it at a a store near you! Adventure and learning await in these heart-warming tales based on the award-winning book series by author and illustrator Anna Dewdney. Join Llama Llama, Nelly Gnu, Luna Giraffe, Euclid the Sheep and Gilroy Goat as they explore their safe, friendly hometown and make childhood memories. On this DVD, watch Llama Llama at his first sleepover with friends! Learn how to share on a play date with Nelly Gnu! Discover what makes Llama Llama’s red pajamas so lucky and so much more! Learn and play with Llama Llama and pals! KIDS FIRST! Film Critic Ava L. comments, “Wow, this series is so adorable and imaginative because the characters are so curious and always find a new adventure! Llama himself is very, very curious.” Milika L. adds, “based on the book by Anna Dewdney is cute, relatable and playful. You get to meet llama llama’s adorable friends such as the adventurous Nelly Ngu, the fashionable Luna Giraffe, Euclid the Genius sheep and the Bully who becomes a friend of Gilroy the Goat. I love how these friends become closer through service, sleepovers and playdates!” Nathalia J. comments, “This kid- friendly, adventurous, funny and teachable series, created by Anna Dewdney, will have you laughing and giggling throughout most of the episodes. It is intriguing, attractive, hysterical and mirthful.” Denise B., KIDS FIRST! Adult Juror adds, “I like that there are different types of stories and not all based on the same theme. The characters are unique because – well, how many cartoons feature llamas? I especially like Mama Llama because she is easy to relate to and is a good mom character.” See their full reviews below. Wow, this series is so adorable and imaginative because the characters are so curious and always find a new adventure! Llama himself is very, very curious. The series is about Llama, his mama (Mama Llama) and one of Llama’s best friends, his favorite stuffed animal Fuzzy! In each episode, the characters face a problem and always seem to find a way to get around them! Llama loves his friends and cares about them a lot. Llama and his friends go through almost everything together. Llama and his friends are inseparable! 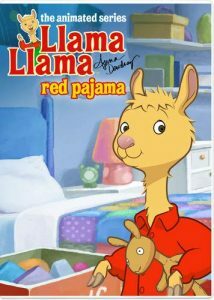 Llama Llama Red Pajama, based on the book by Anna Dewdney is cute, relatable and playful. You get to meet llama llama’s adorable friends such as the adventurous Nelly Ngu, the fashionable Luna Giraffe, Euclid the Genius sheep and the Bully who becomes a friend of Gilroy the Goat. I love how these friends become closer through service, sleepovers and playdates! In the episode “Noisy Neighbor,” Llama Llama and his friends take up community service where they have to clean up the yard of a scary neighbor. They are interrupted several times by the neighbor and can’t finish their work. Eventually, they figure out who the scary neighbor really is. To find out who the neighbor is you’ve got to watch this DVD. I have so many favorite parts, but if i had to pick one, it would be from the episode “Time to Share.” Nelly Ngu accidentally rips off Llama Llama’s favorite teddy bear’s arm. Mama Llama saves the day by sewing the arm back on and their friendship is saved. In that moment, they realize that sharing is really caring. Luna the Giraffe is my favorite character. Besides the fact that she’s so fashionable, she’s also silly and crafty. In the episode “Lucky Pajama,” Luna helps Llama Llama spread the luck with their friends. She does this by making accessories out of the red lucky pajamas. The music is lighthearted and made me feel like I wanted to be apart of their town. Llama Llama lives in a little peaceful town where he bike rides almost everywhere with Mama Llama. In this little town everyone knows each other. There are many messages that I took away from this, but the most important is to be kind, practice patience and realize that your actions can effect others in a positive and negative way. I give this film 5 out of 5 stars and recommend it for ages 2 to 8. This DVD is available January 29, 2019 so look for it. Adventure and learning awaits in these heart-warming tales based on the award-winning book series. The stories follows Llama Llama and his five friends as they explore their friendly hometown and make childhood memories. They face different problems, but always find a way to get around them. You get to see Llama Llama’s get-go sleep-over with three of his friends. You also get to watch Llama Llama as he learns to share at his play-date with Nelly Gnu, which involve his new car his grandparents give him. My favorite part is when Llama Llama learns how to be separated from his adorable bear named Fuzzy Llama, who is his best friend and who he can’t sleep without. I love this part because it’s unquestionably relatable. Fun Fact: I also have my very own Fuzzy Llama, who I can’t bear being separated from. When I’m away from home, it’s my bear CJ and my blanket Cozy. My favorite character is Mama Llama, because she is such a kind, peaceful and loving mother and definitely proves that throughout the series. This DVD’s message teaches you valuable life experiences. It is fantastic for kids and has no bad actions or bad language. I give this DVD 5 out of 5 stars and recommend it for ages 2 through 10. It is available January 29, 2019. So, look for it! I found this DVD quite appealing. I like Llama and the other characters, especially Mama Llama. As a mom, even though my son is now a teenager, the first episode on the DVD brought back memories about a young child not wanting to go to bed. I also like the catchy rhyming. It’s a fun series of shows. There are eight different episodes on the DVD featuring Llama Llama and his mama and friends. All are engaging and have different storylines and are appropriate for young children and some may even teach children how to share. I like the story lines because they are fun to watch. They are engaging with likable characters and perfect for preschoolers. The shows are all animated with bright colors and different scenes. I like that there are different types of stories and not all based on the same theme. The characters are unique because – well, how many cartoons feature llamas? I especially like Mama Llama because she is easy to relate to and is a good mom character. The costumes fit with the characters. Most of the scenes take place where in Llama and Mama’s neighborhood and in their house. They may not be memorable per se, but they fit the story lines. The music sticks out, especially the theme song which is catchy. I can imagine young children singing along.